Being considered as am alternative for Jorginho. When asked about his future he said: ""I believe I'll play more, whether in Real or somewhere else, now is the time for me to play." I reckon somebody like Juve would be a good fit but he wouldn't be guaranteed first team football. Agree about Juve. Wouldn't come cheap though I'd imagine. Even a side like Napoli or Bayern I think he'd fit well in. I've wanted him the last couple of Windows. But like I've said a few times, we are quite stacked in midfield and it's very unlikely Klopp drops Henderson either. Would be a class but for most clubs. Fair play to him for having the right attitude. Maybe a loan move to a Serie A team would be best? He would progress, get first team football, and Madrid can evaluate the situation in a year's time where his value could increase or could be a part of their plans again. Real Madrid want to get rid of certain players and Mateo Kovačić is one of those as there has been quite a bit of interest around Europe (mainly Serie 'A') to sign him. Manchester United apparently contacted Real Madrid over the past couple of days and made a formal offer of €60m but the player has totally refused a move to Old Trafford. It's the best offer by a big margin Real have recieved for the midfielder. €60m for a player that isn't even first choice for Real Madrid... seriously? Real Madrid have a habit of doing the part of selling very well. Kovačić is a good player and was standout in Serie 'A' before he moved to Real. I actually think he'd be a decent buy for anyone for depth and quality. Real Madrid midfielder Mateo Kovacic has reportedly turned down a move to Manchester Unitedbecause he doesn't like Jose Mourinho's tactics. The Daily Mail says Kovacic does not want to play under the Portuguese manager - and would rather stay in Spain than move to Old Trafford. This is the signing I really want. It makes so much sense and it's frustrating we haven't put everything into it. There was a report yesterday that we made an enquiry a month ago but didn't take it any further. He would slot straight into our first eleven - we could probably get him for around 45-50 million - expensive but in this day and age about right for a top quality CM coming in to his prime. I think he would like to play for Pochettino and get a chance to play in a footballing side, in the Champions League. I'm sure Modric would put in a good word as well. I just don't understand why we haven't made this a priority. The latest on this one if MARCA are to be believed is that Kovačić has declared himself in rebellion against Real Madrid and has gone on strike by not turning up to training. The club have told him that they won't negotiate with anyone for his transfer and he desperately wants to move. Reports coming through that Mateo Kovačić has gotten his way and that there’s been no way to convince him to stay so he’s been loaned out to Chelsea FC without any further details at this moment in time. Yeah, looks like going to Chelsea - hard done by Chelsea. I hate our transfer window so much - this was such an obvious easy signing to have made, particular if a loan was available - and I am under no doubt that Kovacic would have been happy to play in the Champions League and for Pochettino. We are not going to do any business, despite having a glaring hole in the centre of midfield. Thing is at this stage it's not even to do with that - it's just the way we operate. 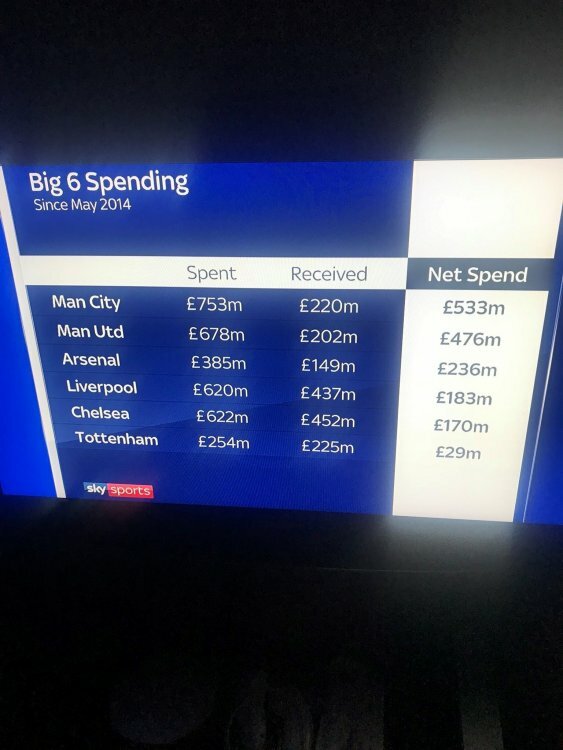 We've actually paid most of the stadium off already - it's everything we're building around it like the Hotel and flats we are taking out loans for - and we don't need the money desperately hence no naming rights deal yet - like Arsenal had to rush into with the Emirates (front-loaded cash up front but a fairly poor overall return). Unfortunately we just operate on a different budget to everyone one else. We won't buy until we sell and clear squad spaces and he we don't seem to have accepted the caravan has moved on yet. You are right though in the sense that this off season has been all about the stadium, and making sure it's ready in time (still touch and go) but the eye seems to have been taken completely off the ball in terms of signings. I think this photo should say it all about the way we operate, and both how impressive it is to have done what we've done the past few years, but also how frustrating it is they've seemingly been 2 or 3 players away from going to on to challenge at the top but we refuse to make that final push. It's strange though, there's been a lot of rumours these past few weeks of Milan and Inter fighting for him but Real reportedly refused to sell and then now they loan him to Chelsea?, only reason i can see behind it it's that Chelsea maybe can pay them more if he succeeds and they want to buy him. Absolutely pointless without an option to buy. Yeah makes sense if it doesn't include an option to buy, and still makes sense even if it does because it'll help them in their purchase of Courtouis like you mentioned and also Chelsea are likely to pay more than the Milan clubs like i said. Kovačić wanted to go mate. He forced Real’s hand and even went on strike. They tried to talk to him but he wasn’t having any of it. He won’t be going back... This is a loan deal but Real have been clever because if he does well for Chelsea in the Premier League, they will make the price big! This is all pointing towards Reuben Loftus-Cheek coming home. I know mate, that's why i commented about the Milan clubs. What i'm saying is that they've asked before (there were rumours even yesterday after it was published Kovacic refused to train) and Madrid said no, and now Chelsea comes and they say yes. Perhaps Kovacic just preferred to play in the Prem or it's like i said, because Chelsea can pay more should he succeed plus it puts them in a better position in their Courtouis chase. BTW: Can you link me to where you told Marc to play in the motorway?, i'm dying to see it. Our correspondents are claiming an option to buy is included.